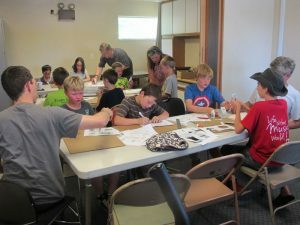 The June 20th Castlemakers Kids project, paper automata. This week we explored the world of paper mechatronics (sometimes called automata or Karakuri in Japan). In the Castlemakers Kids meeting, using 2 sheets of paper cardstock, we created a cam/lever mechanism that caused a sheep’s head to nod when the crank was turned. The kids cut out the parts from 65 lb cardstock then used glue and folds to create the assembly. For thousands of years people have created mechanical toys and dolls out of metal, wood, or in our case paper. The primary use seems to be for entertainment and amusement, but it also offers incredible opportunities to teach people about levers, cams, gears, linkages and other mechanical mechanisms. Ever looked inside a mechanical watch, clock, or older film projector? You’ve probably seen a Geneva stop or Maltese cross (along with a lot of other mechanisms), but may not have known what to call it. A completed paper sheep that nods it head when you turn the crank on the side. We made a design created by Rob Ives, who has an UK website on cardboard cutouts, called “Agreeable Sheep”. It’s a cute model and uses a single cam along with a lever which nods the sheep’s head when the crank is turned. I can also heartly recommend the book Karakuri by Keisuke Saka if you decide to try a hand at making mechanical paper models. He covers how they work and has a wonderful gallery of karakuri that he and high school students in Japan have created. The tips and instructions for basic mechanisms are worth the price of the book if you want to try make different models or creations of your own. It’s been a busy time for Castlemakers this last month; we received our first grant a few weeks ago for equipment. A group of us have been working very hard to create a physical location for Castlemakers, a makerspace, and watch for an announcement soon. 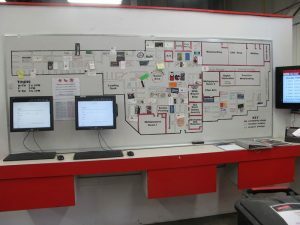 Map of Artisan’s Asylum in Somerville, MA. Several years ago I wrote something about ‘what is a makerspace’, which have become even more popular since then. 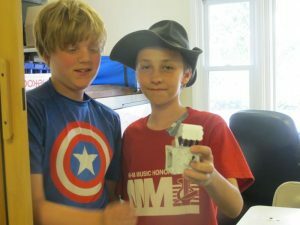 Their numbers and importance has grown since that first post, with the White House proclaiming this week in the US as a Nation of Makers and hosting a reoccurring Maker Faire this coming weekend (June 18th & 19th). If you visit different makerspaces, as some of us have, it’s a very entrepreneurial movement with many different makerspace models. You’ll find makerspaces as community co-ops, ones associated with libraries, ones that are affiliated with science and children’s museums, and even some at universities. One of the main halls in Artisan’s Asylum. 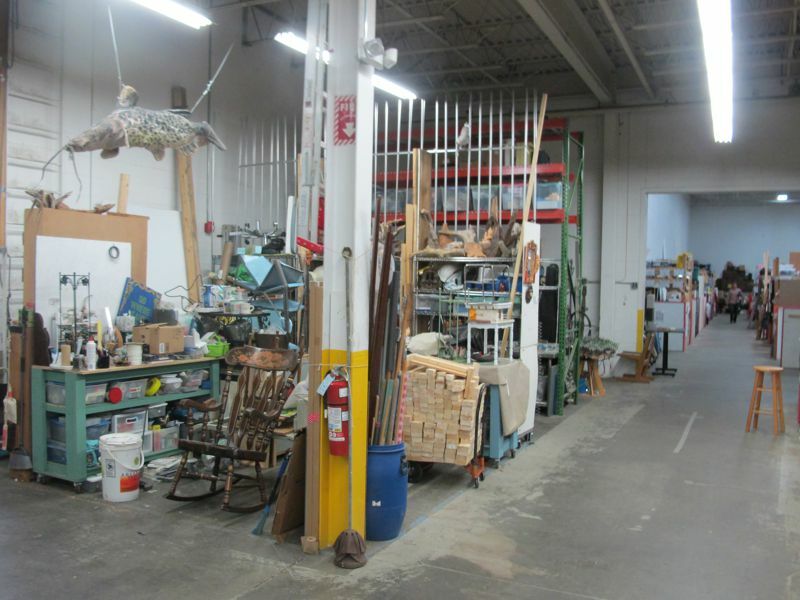 Besides all the workshops, space can be rented for people working on their projects. Perhaps one of the largest and most successful makerspaces is Artisan’s Asylum in Somerville, MA which I visited last year. Started in 2010, it’s grown from a 1,000 sq ft “hole in the wall” to a 40,000 sq ft facility with over 600 members! What impressed me the most in my visit: the projects being built & how they bridged different disciplines along with oozing creativity and innovation. The sheer size & scope of the current facility was also impressive, but the people involved & what the makerspace environment seemed to be the key why it works. 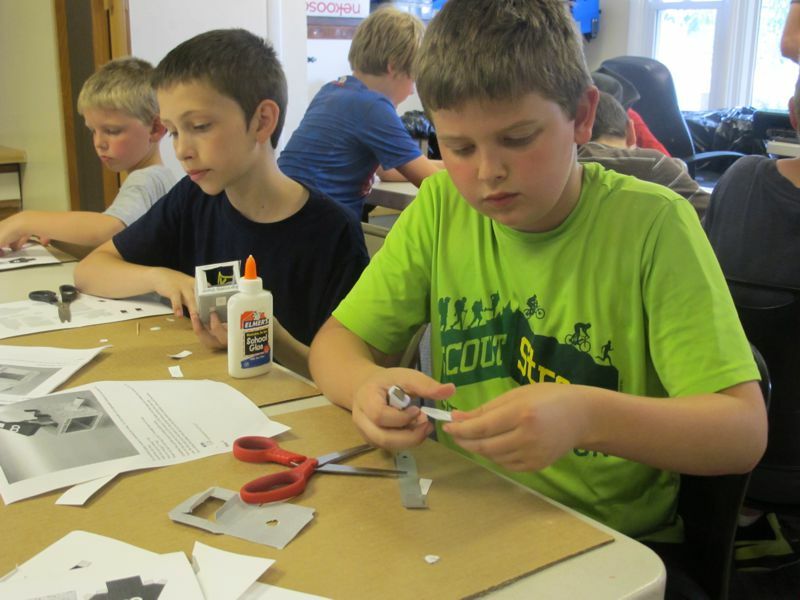 Locally we’ve been making great strides in creating our own makerspace here in Greencastle. Thanks to a June 2016 grant from the Putnam County Community Foundation we’ll be purchasing our first major piece of equipment, a CO2 laser cutter. Of course we’ll need a place to house it, and we’re very close to that.